Business found me in Baltimore today. As the Lyft driver kept cruising along, I suddenly realized that we were going past Johns Hopkins University. I knew two students there. In fact, I took a picture and sent it to both their dads. Later, texted one of those students if she had some free time in the afternoon. She gave me a time frame. She thought we were going to talk. In the past, we have talked a couple of times over the phone about subject selection, peer pressure in college and all that. Once my meetings started wrapping up, I realized that I had about 45 minutes to an hour tops to spare and would still be able to catch my flight. So I texted her “Meet me at the library”. Guess who was surprised to know that I was in Baltimore? Had a great lunch together. Got to know a lot about her college life and we talked a little about how perspectives in life change over the years. It was great to see you Paroma! Thoroughly enjoyed the discussion. Instead of coming to Bangalore late evening to catch my flight to US in the early hours, I decided to come earlier in the afternoon. Got myself checked into a hotel in Whitefield. Also remembered that Austin used to live in the Whitefield area. I had not seen him since he left i2 in 2004. As luck would have it, Austin had time in the evening to meet, Further, he grabbed another old friend of ours – Nathan – from the good old days of our first start up experience. (Nathan and I actually got to work in two start ups together). 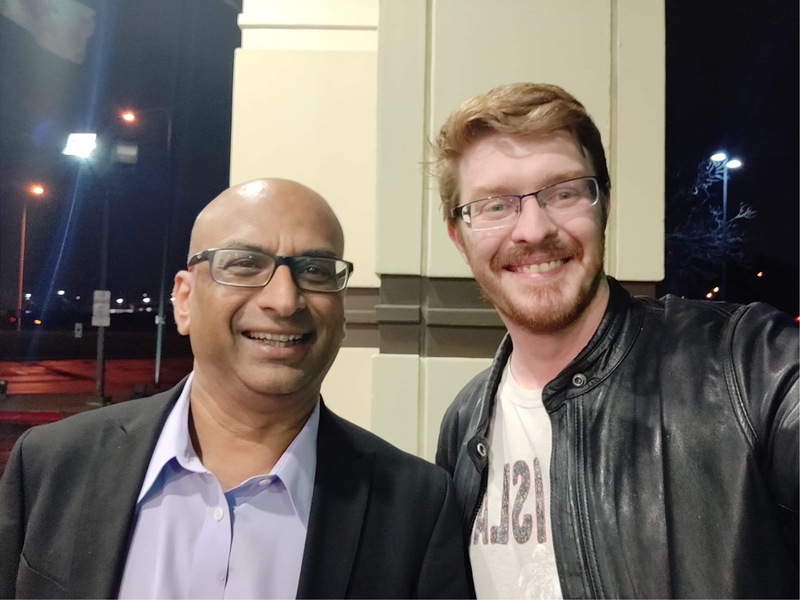 After leaving i2, both of them have had illustrious careers – Austin has done organic farming and then has put in a lot of time with NGOs and Foundations (like The Gates Foundation) for social causes. Nathan has stayed true to the supply chain domain all these years. It was inevitable that we would talk about our learnings from i2 days. We were together for over three hours talking about what went well and what did not go well from those days. What was very interesting was that our learnings themselves have changed as we have grown up. Talent was a great point of discussion. We always had a very strong – and very commonly held (amongst i2-ers anyways) – view of talent in i2. Today, I realize that our views – at least for the three of us – are far more nuanced. We further realized that things that we look back and think we should have done differently is far easier to say today. Living at that moment, we had no other data to go by and would therefore probably make the same mistakes all over again. That said, we agreed that making the same mistake twice was probably preventable. And we believe we did make same mistakes twice. We remembered fondly some of the really outstanding colleagues that we had a chance to work with. And some who, unfortunately, are with us no more. It was like good old times. I used to be somewhat in awe and somewhat a little scared by the sheer amount of IQ power I was surrounded by. As one of the friends we remembered had said then – “In i2, being considered average is an accomplishment”. Like those India Palace dinner meetings. I was there last evening to bring down the average IQ level at our table. The trip started with running into an Atlanta Bengali friend (Sonia) in the airport, if you remember. Looks like I am going to finish the trip the same way. Walked into the flight in Doha and just as I was about to settle down, I thought I heard a voice behind me that I thought I knew!! Glad that Jaba had noticed me. 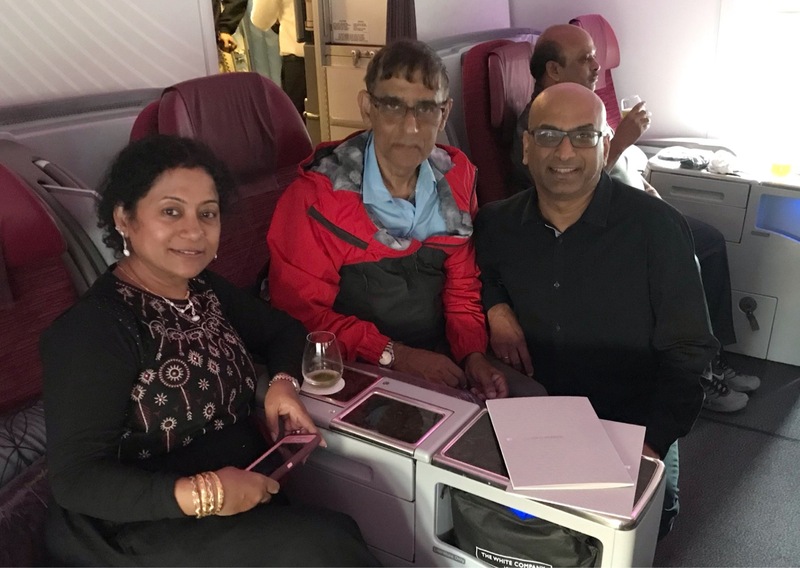 Apparently I had walked past them in the plane without noticing her or her husband Swapan!!! Finally managed to meet Dipti! Neither Dipti nor I could recollect how we got reconnected. She was my junior in IIM-A days and after about 1992, we had lost touch. At some point of time – we got reconnected. I had told her that I would meet her in Bombay when I visit the city. There were some interesting aspects of her life that I wanted to get to know more of. Over a couple of hours and a couple of cups of coffee, I got to hear about her life story. The part that was most intriguing to me is that she has an adopted child. As you probably know, I think the world of people who adopt kids. Experience in volunteering at a center for physically abused kids has taught me that there are more kids than caring parents in this world. What I did not know was that Dipti had adopted a child with learning disabilities. I was fascinated by her taking me thru how she had to retrain herself completely to be able to educate her child. It was amazing hearing her talk about specific incidents on how she had to think of communications in a different way. For all the education we had, we were never trained to deal with these kind of situations. If that was not enough – and she is a single mom raising the child – she also is a successful entrepreneur. She founded a company and has been building the business rather successfully. For all that responsibilities and efforts, she betrayed no sense of stress. In fact, I was a little taken aback by how calmly she has taken her challenges and worked thru them. Did I mention, she helped raise her sister’s daughter too? 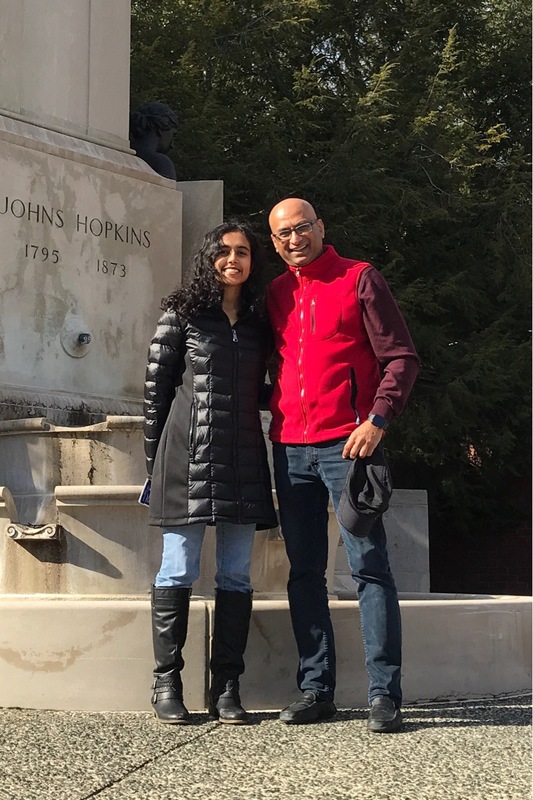 I was so excited hearing about Dipti’s great strides in life that it was only after seeing her off, I realized suddenly that I had completely forgotten to take a picture of us. A few frantic calls later, she graciously agreed to turn around in that crazy Bombay traffic and came back to the hotel I was staying in. Thank you Dipti for spending the time that evening with me and then coming back so I could keep a picture for future. Last evening, I was with my brother’s family in the lounge of the Westin hotel in Kolkata. There weren’t too many guests and the staff there were pampering us with all sorts of ill-deserved attention. Pinaki and Sumana went out of their way to make us feel comfortable. Chef Rubai kept special food coming our way the whole evening. There was another sharply dressed gentleman who kept checking in on us to make sure we were comfortable. In fact, he was the one who had ushered us in. Found out Rishav was his name. As is my wont, I started chatting with him. Eventually found out that he had been to Dallas when he was 13 years old. A little more digging and I found out that he had gone to visit his uncle (mom’s brother). That uncle, it turns out, is our very good friend – Sunny!! Could not believe my luck that I would walk into a hotel in Kolkata for the very first time in my life and the person who would usher us in to the lounge would be our Dallas friend’s “bhagney” (nephew). Rishav and I have some common interests in drinks, as it turns out. I am more of a mixologist (on the cocktail side) and Rishav is more of an oenophile – on his way to become a renowned sommelier some day! … or “Haimanti miss” as we used to call her during our ninth and tenth grades. Made a second foray into North Kolkata (in one day, that too) to meet Mrs. Sinha in her college in Shyambazar. (Maharaja Manindra Ch College). She is probably the only remaining teacher of ours who is still teaching. The journey to go to see her itself was unique. I ditched the car given the crazy traffic in north Kolkata and walked from South City Mall to Rabindra Sarovar Metro station – about 2.2km and took the Metro train (after about thirty years or more). 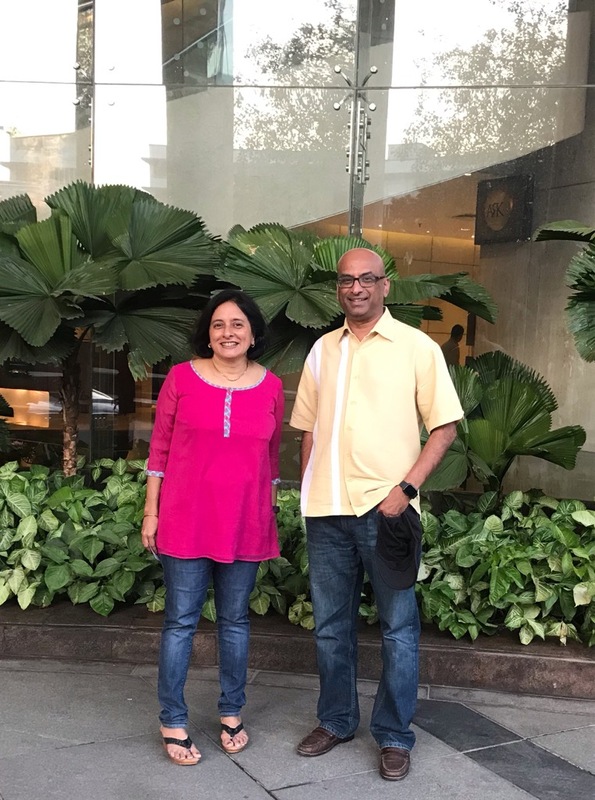 To cap off the walking spree, after meeting her, I also walked from Shyambazar to Salt Lake City – about 3.5km – for my next meeting! When I asked her about her life lessons – she gave me two examples. One – intriguingly – enough was something she said she learnt from a classmate of our batch – Prasant Kelkar. The story she told me would be difficult for me to narrate here without putting somebody else in a somewhat negative light. So, I am going to skip that part. But I have to say this – I was impressed by Haimanti Miss’s modesty and open mindedness to remember an incident and admit to learning from a 14 year old!!! The second learning involved Father Gilson. Somebody who I never had a teacher for myself – but was considered by one of those unparalleled teachers one can possibly have while growing up. It involved the concept of “what is yours”. Very interesting take on the concept of ownership. The summary of the story Mrs. Sinha told me was that just because one created something does not necessarily mean one owns it. If one has a need for it too, that is fine. But if not, it belongs to others who need it. 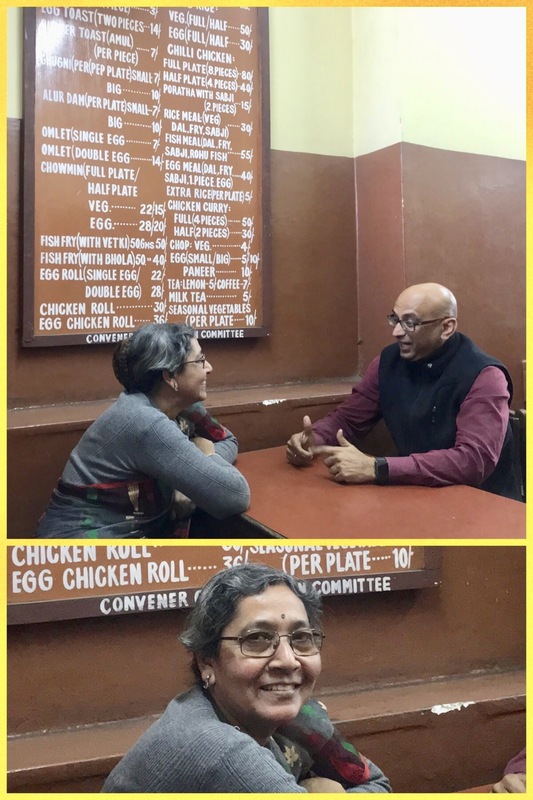 Sitting in the cafeteria of the college (the staff room was too crowded), I picked up the life story of Mrs. Sinha, her father, her mother and all her siblings. I was also excited by some of the causes she wants to pick up to give her time after retiring at the end of this year. I am personally inspired by those causes too. Meeting Haimanti Miss: PRICELESS ! On my way from Kalyani to Kolkata, the first stop was at Mrs. Basu’s place. This was my foray into North Kolkata after a very long time. It is still as crowded as I remember. Seemed to be much cleaner than what I could recollect. I had heard a lot about Mrs. Basu from her son – good old Avi – back in Atlanta. During our motorbike rides to grab a lunch or snacks to places around north Atlanta areas, Avi had talked quite some about his mom and all the places she has lived in her life. 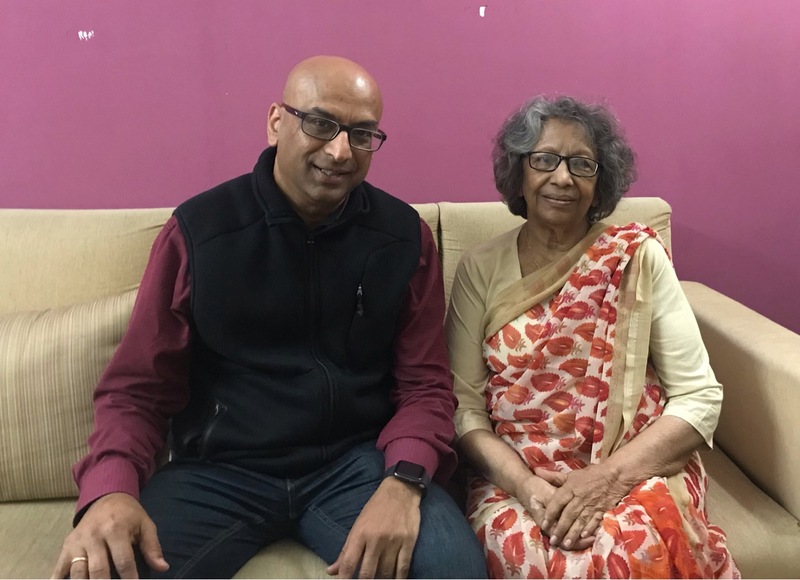 What my brother and I found very refreshing in our conversations with Mrs. Basu was her very different attitude towards life – than most other octogenarians that I know of, anyways. In all the time that we spent together, she came across as a very purposeful and independent minded person. Further, she did not complain about one thing. Instead she talked about how she is happy with her lot – even with the fact that she lost her husband and her two sons are abroad and so she lives all by herself. “What is the secret to happiness, then?”, I asked her. “Managing your expectations of others,” she reflected very quickly. We left promising to meet again during my future trips. 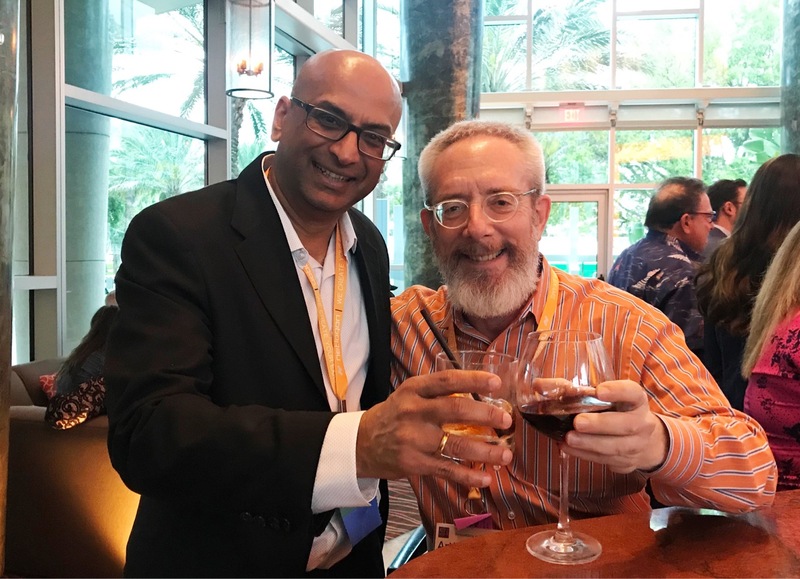 While Somshekhar and I went to MBA school together, I did not know him much. In fact, our face to face interactions could not have been more than a couple of times. Over the last few years, I got intrigued by his comments on others’ posts on Facebook. What absolutely got my attention was his fascinating knowledge on very diverse topics. In fact, he is the only person whose book suggestions have been a 100% hit for me. It is more a reflection of similar interests. Also, we share common interest in groaners. Admittedly, his puns are more witty and wicked. We had promised to sit down some time to exchange notes on life. I certainly felt I had a lot to learn from him and his life story. The new year started rather auspiciously for me with the first activity being sitting at a coffee bar in Bombay with this gentleman. What fascinated me in his life story is how he has often taken the road less traveled. 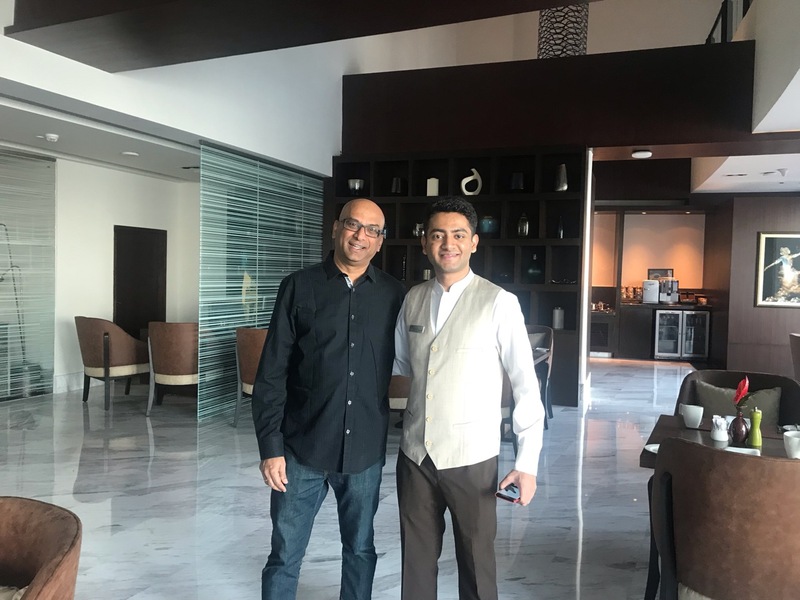 When all of us went after big jobs all starry eyed clasping an MBA degree under our arms – from IIM-A, no less – Somshekhar went back to his home in Lucknow after opting out of placement. He wanted to figure out what he wanted to do and be. I think for about four years he was in this state of self discovery and also thinking about going after Civil Services (he comes from a family of multiple Civil Servants). It was during this time that he tried out a lot of things. I was amazed by how much Western classical and Indian classical he grasps. And when I say Indian classical – both Hindustani classical as well as Carnatic classical. In fact he took me thru some real in depth concepts that differentiate Hindustani and Carnatic classical music. I am completely out of depths in Western classical music – so that part was a short discussion. Our discussions then veered towards books and his love for reading. Apparently, during that discovery period, he started reading up all sorts of books. We exchanged notes on what one or two books have influenced us most. For him, it was “Aztecs” by Inga Clendinnen. We also debated the pros and cons of reading books the traditional paper form (his preferred mode) and the electronic form (what I do today). “Any learning from the life choices you have made?”, I enquired. “People will respect you for who you are”, he said. He reflected on the fallacy of human beings missing the opportunity to discover themselves and being genuine rather than follow the precepts set by others on what “should be”. The deep irony he felt, was that eventually, respect and recognition from others come from being who you are rather than what others might have wanted you to be. We decided to have lunch at this place. I wanted to see his collection of books as well as meet his wife and two daughters. I was glad that I did so because I found out a lot of intersection points with his wife Debanjana. First, she is from Durgapur (much junior to me). 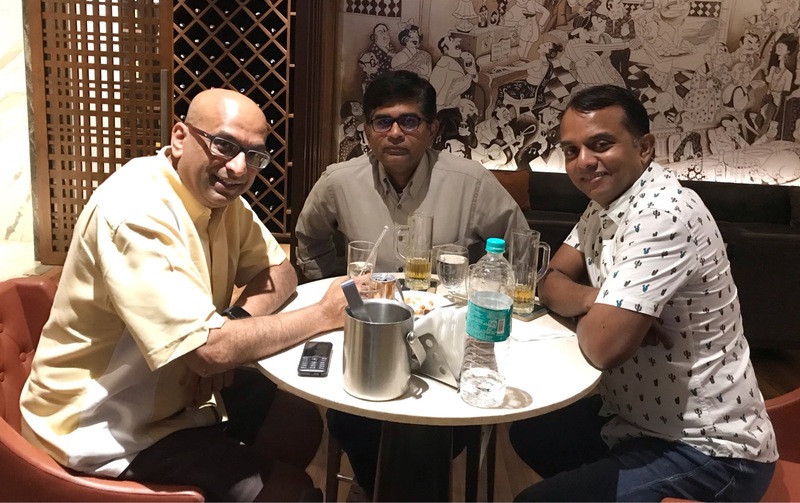 That evening I was to meet a school mate of mine – Debabrata – who had to back out at last moment due to a gall bladder surgery. (I know, the extent people will go to avoid meeting me 🙂 ). Guess what? Debanjana and Debabrata grew up as next door neighbors! Remember Mrs. Sur who I went to visit in Durgapur before leaving town? Well a couple of houses down – literally on the same street – is where Debanjan’s folks (now, only her mom) live! 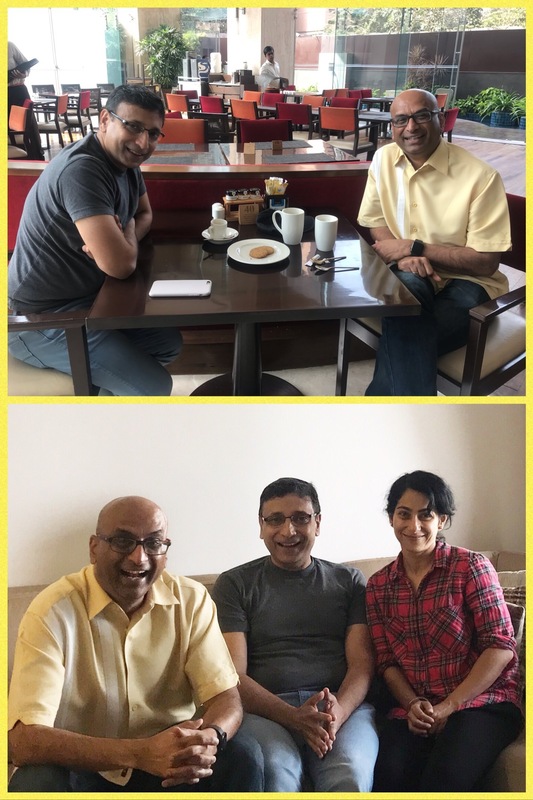 We found many more common friends – Paromita in New York (who is the sister of an old friend of mine; Sharmila and I are now very close to her), Jay Vikram’s sister and so on. When I mentioned to her that I was going to meet Mrs. Dhar in Pune the next day, she knew her too! But the best part was that she is a runner. She is much faster than me (10Ks in forty something minutes) and puts in more miles than I do now. Regardless, we had a good time exchanging notes on our running experiences. Maybe we can get Somshekhar to run someday and we can participate in an organized race together! I truly should have become closer to Somshekhar much earlier in my life.